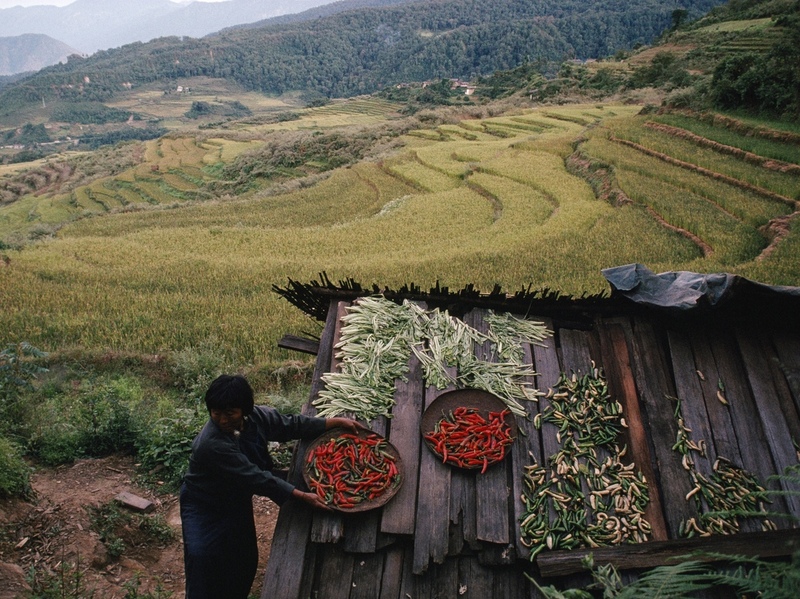 A Bhutanese farmer puts her harvest of chilies on the roof of a shed to dry and protect it from wild boars, deer, and monkeys in 2006. 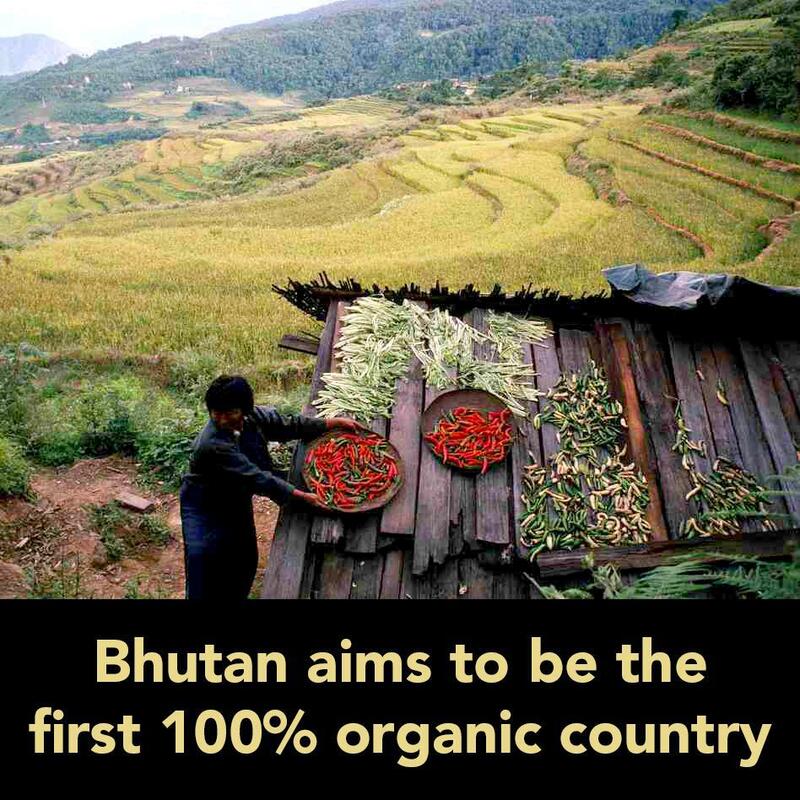 But Bhutan, which has only 700,000 people — most of whom are farmers — has another shot at international fame if it can make good on a recent pledge to become the first country in the world to convert to a 100 percent organic agricultural system. Last month at the Rio+20 Conference on Sustainable Development, Prime Minister Jigmi Thinley said his government is developing a National Organic Policy because the country's farmers are increasingly convinced that "by working in harmony with nature, they can help sustain the flow of nature's bounties." Going all-out organic is a lofty goal for any country given that many farmers — and poor farmers in particular — covet chemical fertilizers and pesticides to enrich their soil, boost production and keep diseases and pests at bay. But Andre Leu, an Australian adviser to the Bhutanese government and the president of the International Federation of Organic Agriculture Movements, says it's very doable. "I don't think it's going to be that difficult given that the majority of the agricultural land is already organic by default," Leu tells The Salt. According to the World Food Program, Bhutanese farmers mainly grow rice and corn, as well as some fruits and vegetables, including potatoes and oranges. But as demand for food has grown in recent years, the country has been forced to import rice and other foods from India, and today Bhutan is a net food importer. One of the few products Bhutan exports to the U.S. is red rice; Lotus Foods sells it to chains like Whole Foods. Bhutanese red rice is more nutritious and tastes nuttier than white rice, its boosters say, and is well-suited to pilaf, as Monica Bhide reported for NPR's Kitchen Window earlier this year. The rice does not have organic certification, but Lotus Foods says it been grown without the use of pesticides or other chemical inputs for centuries. The Ministry of Agriculture says the organic program, launched in 2007, is not just about protecting the environment. It will also train farmers in new methods that will help them grow more food and move the country closer to self-sufficiency. The ministry is now training extension workers in organic methods and giving farmers who go organic priority for government assistance. Not everyone is so sure that a 100 percent organic Bhutan is a great idea. Leu says he's found some resistance among researchers at the Ministry of Agriculture who've been trained in conventional farming techniques abroad. And an article last year in the Bhutan Observer notes that many farmers who grow export crops like apple, Mandarin orange, and potato already rely heavily on chemical fertilizers and could be reluctant to give them up. Still, Leu is optimistic that Bhutan's burgeoning organic agriculture research centers will eventually be able to come up with organic methods to boost yields and manage the problems of these crops. "All these problems are solvable, they just need a few more years of research to come up with some more effective solutions," Leu says.